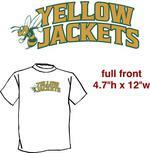 Welcome to your Yellow Jackets Spirit Wear Web-Site! 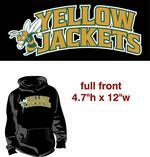 You can add the player's name and number to the right sleeve of the Quarter Zip Rain Jacket and the Parent/Sibling Sweatshirt for $8 per garment. Click the yellow "Personalization" button after you have added the Rain Jacket and/or Parent/Sibling Sweatshirt to your cart. 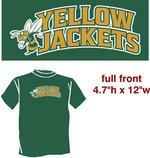 The price of the Fleece Blanket includes having the team logo and your Last Name embroidered on the Blanket. After you have added the Blanket to your cart press the yellow "Personalization" button to input your Last Name.